With a host of other countries assessing the usefulness of similar taxes, it is safe to say that the fight against obesity and fizzy drinks has certainly begun. In order to tackle high sugar intake in India, subtle taxes like the ones imposed on fizzy drinks are warranted, write Anmol Agarwal and Suchika Chopra. The sugar tax is a “tax for love” said Jamie Oliver, a celebrity chef from UK, in response to the recently imposed tax on sugar based drinks in his country. The much-awaited sugar tax, mainly targeting Sweetened Carbonated Beverages (SCB), came into force in UK on 6th April, 2018 amidst fears of obesity rising to catastrophic proportions with a quarter of the population falling in the over-weight category. Ireland followed suit with a similar tax, imposed on 1st May, 2018 to tackle the problem of child obesity. With a host of other countries assessing the usefulness of similar taxes, it is safe to say that the fight against obesity and fizzy drinks has certainly begun. This immediately raises a question—how are such drinks taxed in India? Both mineral and aerated waters, containing added sugar or other sweetening matter, are placed in the highest tax bracket of 28% under the new GST regime with an additional ‘compensation cess’ of 12%. To be clear, higher taxes are by virtue of categorising these drinks as luxury items and not explicitly due to their high sugar content. This tax rate is much higher than what brands like Thums up and Coca-Cola paid earlier in most states – below 28 %. As expected, it was met with a backlash from the soft drinks industry, which enjoyed a compound annual growth rate of 11% in two years prior the tax regulation. Soft drink players are not only petitioning the government to reduce the tax burden but have also started deploying various innovative tactics to steer clear of it. Thums up, market leader in India, has recently launched Thums up ‘Charged’ which uses caffeine in such large amounts that it is now categorised under ‘caffeinated beverage’, falling under the tax slab of 18%. The industry is also considering adding some amount of fruit juices to the original recipe in order to evade taxes. In this context, it is worth examining if the plea of the soft drink industry for lower taxes is justified and if not, does a high tax on SCBs really work? A look at the alarming recent figures of obesity related diseases, particularly diabetes, should suffice to shut the advocates of lowering taxes on SCBs. It could be construed as ironic that in a country marred by hunger and malnutrition, obesity can be a focal point of discussion. But sense calls for acknowledging, not evading, the hard reality. A 2014 study in the medical journal, The Lancet, shows that India stood 5th in the world for highest male obesity and 3rd for female obesity. India is home to 9.8 million obese men and 20 million obese women. The New England Journal of medicine notes that in 2015, there were 14.4 million over-weight children in India, next only to China with 15.3 million. The incidence of diabetes in India has increased by 100%. As revealed by WHO data , 63 million people were diagnosed with the chronic disease in 2013 as compared to 32 million in 2000. At this rate, India is on track to surpass China (over 100 million) and claim the unenviable title of ‘World’s Diabetes Capital’. Now, since the question of any sympathy for soft drink manufacturers is out of the ballpark, we address the more important issue of the actual impact of a higher tax on the demand for SCBs. Econ 101 suggests two important channels through which such a tax can reduce demand. First, a direct reduction in consumption as long as the producers pass on the increased price to the consumers forcing them to substitute away. Second, an indirect reduction as the companies try to alter their recipes just like the aforementioned caffeine example, and in the process lose a chunk of their customers resistant to change. Empirics lend credibility to the argument. Mexico introduced a 10% additional tax on SCBs in January 2014. Figures from Mexico’s National Institute for Public Health report that sales declined by 5.5% in 2014 and 9.7% in 2015 in real terms. France levied the tax in January 2012 and initial reports indicated a 3.3 % decline in consumption of sweetened drinks. Data from Hungary, Denmark and numerous others paint a similar picture. 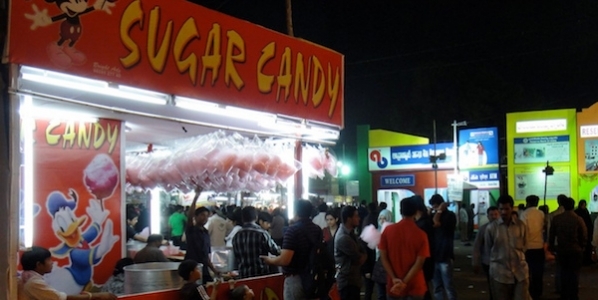 A candy floss stall in Hyderabad. Photo credit: Numaish, Flickr, CC BY-NC-NC 2.0. Critics of the sugar-tax often argue that it will hit the poorest the hardest. Perhaps, they should take a stroll along the poorest streets and lanes of the nation and observe that it’s not the poor who enjoy the luxury of a chilled beverage and comforts of a sedentary lifestyle. But rather, they are the ones who contribute to 40% of the world’s malnourished population. Although obesity has increased in rural India, it is incomparable to the rate of rise in the urban part where, if left unchecked, it will soon culminate into a health hazard. Imposing an explicit sugar tax in India is inconceivable—sugar, being an essential commodity, is a part of the public distribution system and there’s a strong presence of politically sensitive sugar lobbies in a few states. Take for instance, the states of Uttar Pradesh and Maharashtra which possess strong sugar lobbies. Largest in terms of production, these states account for 45% of the country’s sugar mills and 70% of the total production in the country. The Cabinet has, in fact, recently approved a subsidy of around Rs 55 per tonne for sugarcane farmers and mills. The move comes to the rescue of sugar mills that have been struggling to pay the farmers, with arrears mounting to Rs 20,000 crores, owing to a glut and drop in prices. Thus, in order to tackle high sugar intake, subtle taxes like the ones imposed on SCBs are warranted. However, finding ways to raise taxes on products using dangerously high proportions of sugar like chocolates and canned juices (with self-proclaimed health benefits) will not be duck soup. The onus, thus, falls on the people themselves to drastically rethink their approach towards a healthy life. Sports icons, considered the epitome of physical fitness by the youth, can certainly help. Most of them including the Indian cricket team have, at some point, endorsed brands of such drinks. It’s time they understand their responsibility as ‘people of influence’. Revamping the lifestyle of a nation is a long-term process, but for starters, taking the fizz out of these fizzy drinks will be a victory. Anmol Agarwal has completed his MSc in Economics at the London School of Economics and Political Science, and currently works for CAFRAL, Reserve Bank of India. You can follow his blog for more articles. Suchika Chopra is a PhD student in Economics at University of Georgia. She is a former researcher at Reserve Bank of India and economics content writer at Mint. Wow this is interesting article i read so far, really interesting! !